While Dr. Afzal Suleman has always seen the benefit of Mitacs-Accelerate internships for students and their industry partner, he also saw the potential to further his own research and academic career. A professor at the University of Victoria’s Faculty of Engineering, Dr. Suleman has been participating in the program since its inception, with more than 15 internships supervised so far. 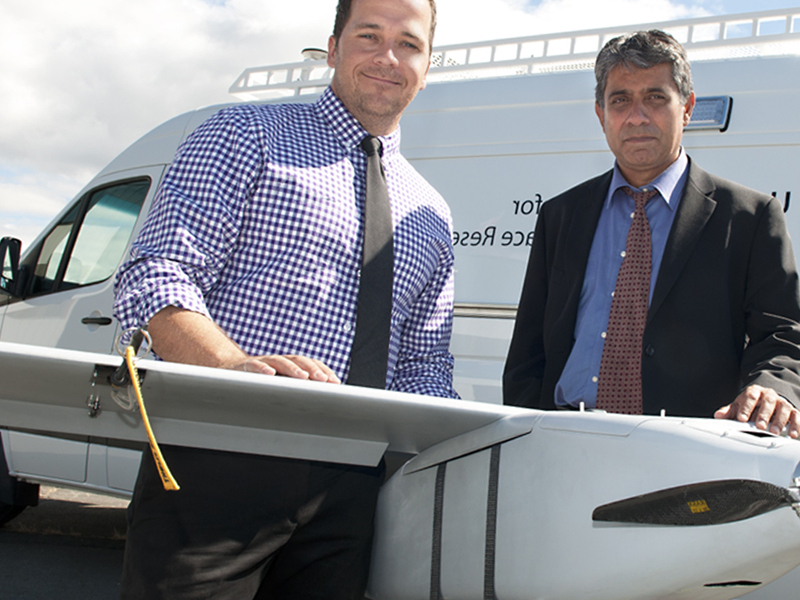 One of the first Mitacs-Accelerate internships Dr. Suleman supervised was a research project with Profile Composites, based on Vancouver Island. The company develops advanced composite products, which have an endless number of applications in the aerospace, automotive, ship building and sports industries, just to name a few. Composites are lightweight, stronger and more durable than traditional materials such as metal alloys or plastics. The internship investigated how to minimize defects during the molding process of composite structures. The success of that project inspired Dr. Suleman to submit additional research proposals, and led to a Collaborative Research and Development grant for $300,000 from the Natural Sciences and Engineering Research Council of Canada to continue further his research into composites. The collaborations with industry and international partners resulted in the creation of the UVic Center for Aerospace Research. The design and manufacturing of unmanned air vehicles for civilian application requires extensive use of composite materials for the airframe. Then in 2012, Dr. Suleman was invited to participate in the establishment of the Composite Research Network (CRN) – led by the UBC, and with nodes at the University of BC (Okanagan) and the Composites Innovation Centre in Winnipeg. Launched with a $9.8 million investment from the Government of Canada, the CRN brings together academia and industry in Western Canada to solve manufacturing and design challenges in the use of composite materials. “It all started with the Mitacs-Accelerate internship with a small to medium sized company. One research project led to another and another and now we have a Center for Aerospace Research and we are participating in a major initiative such as the Composite Research Network, a consortium of universities and industry looking to grow the composite manufacturing industry across Western Canada by sharing knowledge,” Suleman enthused. Mitacs gratefully acknowledges the Government of Canada, the Networks of Centres of Excellence's Industrial Research and Development Internship program, Western Economic Diversification, and the Government of British Columbia for their support of Mitacs-Accelerate in the province.